Rice and wheat provide two out every five calories that humans consume. Like other plants, crop plants convert carbon dioxide (or CO2) from the air into sugars and other carbohydrates. They also take up minerals and other nutrients from the soil. The increase in CO2 in the atmosphere that has happened since the Industrial Revolution is thought to have increased the production of sugars and other carbohydrates in plants by up to 46%. CO2 levels are expected to rise even further in the coming decades; and higher levels of CO2 are known to lead to lower levels of proteins in plants. But less is known about the effects of CO2 levels on the concentrations of minerals and other nutrients in plants. Loladze has investigated the effect of rising CO2 levels on the nutrient levels in food plants by analyzing data on 130 varieties of plants: his dataset includes the results of 7761 observations made over the last 30 years, by researchers around the world. Elevated CO2 levels were found to reduce the overall concentration of 25 important minerals—including calcium, potassium, zinc, and iron—in plants by 8% on average. Furthermore, Loladze found that an increased exposure to CO2 also increased the ratio of carbohydrates to minerals in these plants. This reduction in the nutritional value of plants could have profound impacts on human health: a diet that is deficient in minerals and other nutrients can cause malnutrition, even if a person consumes enough calories. This type of malnutrition is common around the world because many people eat only a limited number of staple crops, and do not eat enough foods that are rich in minerals, such as fruits, vegetables, dairy and meats. Diets that are poor in minerals (in particular, zinc and iron) lead to reduced growth in childhood, to a reduced ability to fight off infections, and to higher rates of maternal and child deaths. Loladze argues that these changes might contribute to the rise in obesity, as people eat increasingly starchy plant-based foods, and eat more to compensate for the lower mineral levels found in crops. Looking to the future, these findings highlight the importance of breeding food crops to be more nutritious as the world's CO2 levels continue to rise. Mankind's ultimate source of carbohydrates is atmospheric carbon dioxide (CO2) converted by photosynthesis to sugars. The bulk of the terrestrial conversion of CO2-to-carbohydrates is done by C3 plants, which account for over three quarters of global primary production and for over 90% of Earth's plant species (Still and Berry, 2003). (If not stated otherwise, hereafter, terms ‘plant(s)’ and ‘crop(s)’ refer to C3 species). When exposed to CO2 concentrations twice the preindustrial level of ∼280 ppm, plants increase the synthesis of carbohydrates by 19–46% (Leakey et al., 2009). Currently, CO2 concentrations are reaching 400 ppm—the highest level since the dawn of agriculture and likely to be the highest since the rise of modern humans (Siegenthaler et al., 2005). Within a single human lifespan, CO2 levels are projected to reach 421–936 ppm (IPCC, 2013). Will rising CO2 concentrations—one of the most certain and pervasive aspects of global climate change—alter the quality of crops and wild plants? Will the CO2-induced stimulation of carbohydrate synthesis increase the carbohydrates-to-minerals ratio in crops? Can such shifts in crop quality affect human nutrition and health? 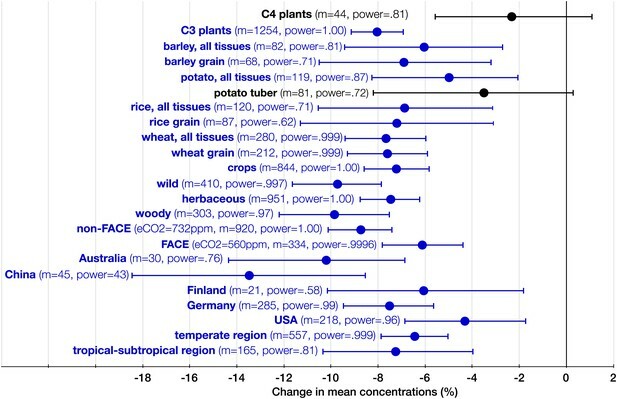 Elevated CO2 effects on plant quantity (productivity and total biomass) have been extensively studied and show higher agricultural yields for crops, including wheat, rice, barley, and potato. But eCO2 effects on plant quality, and possible cascading effects on human nutrition, have been largely ignored in the estimation of the impact of eCO2 on humans. Notably, IPCC (2007, 2013) and AAAC Climate Science Panel (2014) include direct CO2 effects (e.g., ocean acidification) in their climate change assessments but do not mention any CO2 effects on crop or wild plant quality. However, it is unwarranted to assume that plants will balance the increased carbohydrate synthesis with other adjustments to their physiology to maintain the nutritional quality for their consumers in a state of unperturbed homeostasis. The stoichiometry—the relative ratios of chemical elements—in plants is plastic and, to a considerable degree, reflects their environment (Sterner and Elser, 2002). However, detecting CO2-induced shifts in plant quality is challenging for several reasons. First, plant quality involves multiple nutritional currencies, for example macronutrients (carbohydrates, protein, and fat) and micronutrients (minerals, vitamins and phytonutrients). Assessing relative changes within and among multiple currencies requires significantly more effort and funding than measuring only plant quantity (e.g., yield). Second, plant quality, including the plant ionome—all the minerals and trace-elements found in a plant (Lahner et al., 2003; Salt et al., 2008)—is inherently variable; and measurement imprecisions further amplify the variability. For example, Stefan et al. (1997) report the accuracy test for 39 facilities that analyzed samples of the same plant tissues: the inter-laboratory variance was 6.5% for N, but twice as large for phosphorus (P) and calcium (Ca), and reached 130% for sodium (Na). Therefore, CO2-induced changes in the plant ionome (the signal) can be easily lost amid highly variable data (the noise), especially when such data are limited and sample sizes are small. However, it is important to bear in mind that a low signal-to-noise ratio does not imply that the signal is practically insignificant, especially if it is global and sustained—a point revisited in the ‘Discussion’. The first empirical evidence of lower mineral content in plants exposed to eCO2 appeared at least over a quarter century ago (e.g., Porter and Grodzinski, 1984; Peet et al., 1986; O’Neill et al., 1987). Physiological mechanisms responsible for the overall decline of plant mineral content—with expected changes being non-uniform across minerals—have been proposed: the increased carbohydrate production combined with other eCO2 effects such as reduced transpiration (Loladze, 2002; McGrath and Lobell, 2013). However, most of the experimental evidence showing CO2-induced mineral declines came from artificial facilities, mainly closed chambers and glasshouses, and many results were statistically non-significant. This led some research groups to challenge altogether the notion of lower mineral content in plants exposed to eCO2 in field conditions. Such conditions are most accurately represented in Free-Air Carbon dioxide Enrichment (FACE) centers, which have been established in at least 11 countries. In the grains of rice harvested at four FACE paddies in Japan, Lieffering et al. (2004) found no decline in any of the minerals but lower N content. The result disagreed with Seneweera and Conroy (1997), who were the first to report lower iron (Fe) and zinc (Zn) in grains of rice grown at eCO2 and warned that altered rice quality can negatively affect developing countries. Lieffering et al. (2004), however, argued that the result of Seneweera and Conroy (1997) could be an artifact of growing rice in pots, which restrict rooting volumes. They hypothesized that in FACE studies, which provide unrestricted rooting volumes, plants would increase uptake of all minerals to balance the increased carbohydrate production. This hypothesis, however, found no support in the FACE studies of Pang et al. (2005) and Yang et al. (2007) (carried out in China and latitudinally not very far from the study in Japan), who found that eCO2 significantly altered the content of several minerals in rice grains. The contradictory results coming from these studies on rice seem perplexing, especially in light of the very robust effect that eCO2 has on N in non-leguminous plants. Elevated CO2 reduces N concentrations by 10–18% systemically throughout various tissues: leaves, stems, roots, tubers, reproductive and edible parts, including seeds and grains (Cotrufo et al., 1998; Jablonski et al., 2002; Taub et al., 2008). If the increased carbohydrate production dilutes the nutrient content in plants, why does the dichotomy seem to exist between the responses of N and minerals to eCO2? In addition to the carbohydrate dilution and reduced transpiration, eCO2 can further lower N concentrations in plants by: (1) reducing concentrations of Rubisco—one of the most abundant proteins on Earth that comprises a sizable N-pool in plants (Drake et al., 1997), and (2) inhibiting nitrate assimilation (Bloom et al., 2010). Hence, it is reasonable to expect the effect of eCO2 on N to be larger and, thus, easier to discern than its effect on most minerals. The stronger signal for N, combined with the plentiful and less noisy data on this element, can help explain why by the end of last century the effect of eCO2 on N had been already elucidated (Cotrufo et al., 1998), but its effect on minerals has remained elusive. The obscure nature of the effect of eCO2 on minerals becomes particularly apparent in the largest to date meta-analysis on the issue by Duval et al. (2011), who fragmented data from 56 eCO2 studies into 67 cases. In 47 of the cases, the effect of eCO2 on minerals was statistically non-significant, that is the 95% Confidence Interval (CI) for the effect size overlapped with 0. The remaining 20 cases were statistically significant but showed no pattern: for example, Fe increased in grasses but decreased in trees, Zn increased in roots but decreased in stems, while in grains only sulfur (S) decreased. Duval et al. (2011) concluded: “A major finding of this synthesis is the lack of effect of CO2 on crop grains nutrient concentration”. This would imply laying to rest the hypothesis that eCO2 consistently alters the plant ionome and would render mitigation efforts to combat declining crop mineral concentrations in the rising CO2 world unnecessary. However, a closer examination of the results of Duval et al. (2011) reveals that every statistically significant increase in mineral concentrations was obtained by bootstrapping a sample of size 2, 4 or 5—a recipe for generating invalid 95% CIs. Ioannidis (2005) showed that false research findings, stemming from small sample sizes and associated low statistical power, are a persistent problem in biomedical sciences. Calling the problem as ‘power failure’, Button et al. (2013) emphasized that the probability of a research finding to reflect a true effect drops drastically if the statistical power is reduced from 0.80 (considered as appropriate) to low levels, for example <0.30. Since the power of a statistical test drops non-linearly with the effect size, a sample size that is sufficient for detecting a 15% effect, for example a decline in N content, can be inadequate for detecting a 5% effect, for example a decline in a mineral content. Considering that the standard deviation of mineral concentrations in a plant tissue can reach 25% (Duquesnay et al., 2000; Lahner et al., 2003), the 5% effect size standardized as Cohen's d is d = 5/25 = 0.2. A t test applied for d = 0.2 to a sample size of 3–5—a typical size used in eCO2 studies—yields the power of 0.06–0.10 (Faul et al., 2007). (Unfortunately, MetaWin (Rosenberg et al., 2000), a statistical package routinely used in meta-analytic and other CO2 studies in ecology, provides neither a priori nor post-hoc power estimates.) Such a small power not only raises the probability of obtaining a false negative to 90–94% but also increases the likelihood that a statistically significant result does not reflect a true effect (Button et al., 2013). Does eCO2 shift the plant ionome? If yes, what are the direction and magnitude of shifts for individual chemical elements? How does the effect of eCO2 on N compares to its effect on minerals? Do FACE studies differ principally from non-FACE studies in their effect on the plant ionome? Do the plant ionomes in temperate and subtropical/tropical regions differ in their response to eCO2? Do the ionomes of photosynthetic tissues and edible parts differ in their response to eCO2? How does eCO2 affect the ionomes of various plant groups (woody/herbaceous, wild/crops, C3/C4) and grains of the world's top C3 cereals—wheat, rice, and barley? For brevity, hereafter ‘minerals’ refer to all elements except C, hydrogen (H), oxygen (O), and N. All results are for C3 plants except when noted otherwise. Plotting the effect sizes (with 95% CIs) for the 25 minerals against their respective statistical power reveals a clear pattern (Figure 1). In the very low power (<0.20) region, the noise completely hides the CO2-induced shift of the plant ionome. In the low power region (<0.40), the shift still remains obscure. As the statistical power increases, so does the likelihood that a statistically significant result reflects true effect and, consequently, the direction and the magnitude of the CO2 effect on minerals become increasingly visible in the higher power regions of the plot. To increase the likelihood of reporting true effects, only results with the statistical power >0.40 are reported in this section. However, Figure 1–source data 1 lists all the results together with their p-values irrespective of the statistical power (e.g., results for chromium (Cr) or the bean ionome are not shown here due to low power, but are listed in Figure 1–source data 1). The patterns of change within edible and foliar tissues are similar: N, P, Ca, Mg, Zn, and Cu declined significantly in both tissues (Figures 3, 4). Aside from Mn, only K showed no significant decline in the edible tissues (on Figure 1, it is visible as one of the only two black 95% CI in the ‘High Power’ region). In the foliar tissues, Mg declined the most (−12.3%, −16 to −8.7), which is congruent with the hypothesis of McGrath and Lobell (2013) that Mg should exhibit a larger decline in photosynthetic tissues because ‘chlorophyll requires a large fraction of total plant Mg, and chlorophyll concentration is reduced by growth in elevated CO2’. However, the 95% CIs for Mg and for most other minerals overlap. A richer dataset would shed more light on the issue of Mg in photosynthetic tissues. As expected, among all elements N declined the most (−15%, −17.8 to −13.1, p<0.00001) (Figure 2), matching very closely previous findings (Figures 3–6): the 17–19% decline in leaves found by Cotrufo et al. (1998) and the 14% decline in seeds found by Jablonski et al. (2002). 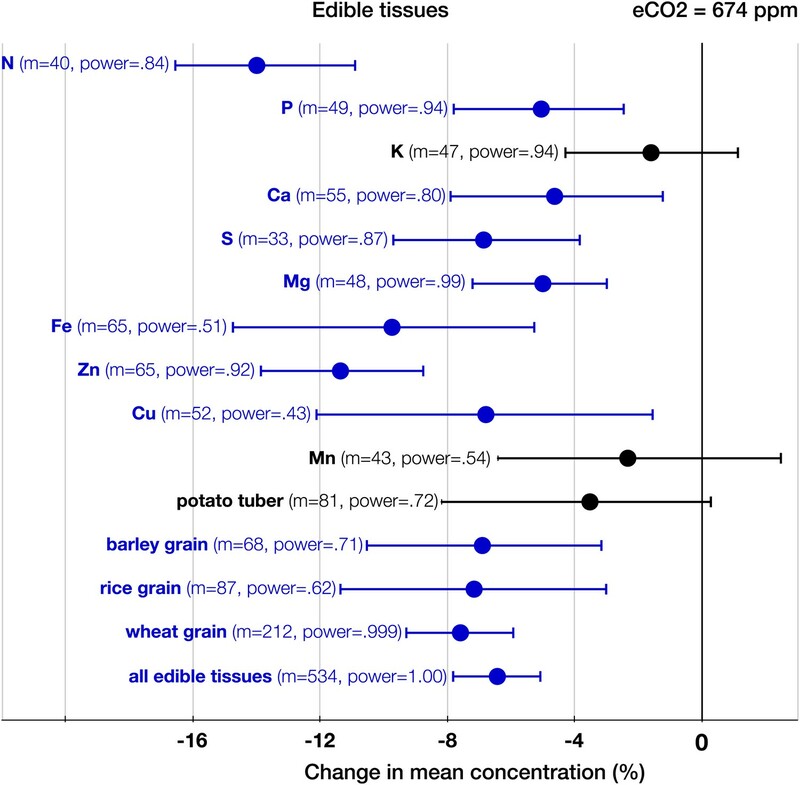 Since the contents of N and protein correlate strongly in plant tissues, the lower N in edible tissues (Figure 4) corroborates the protein declines in crops found by Taub et al. (2008). 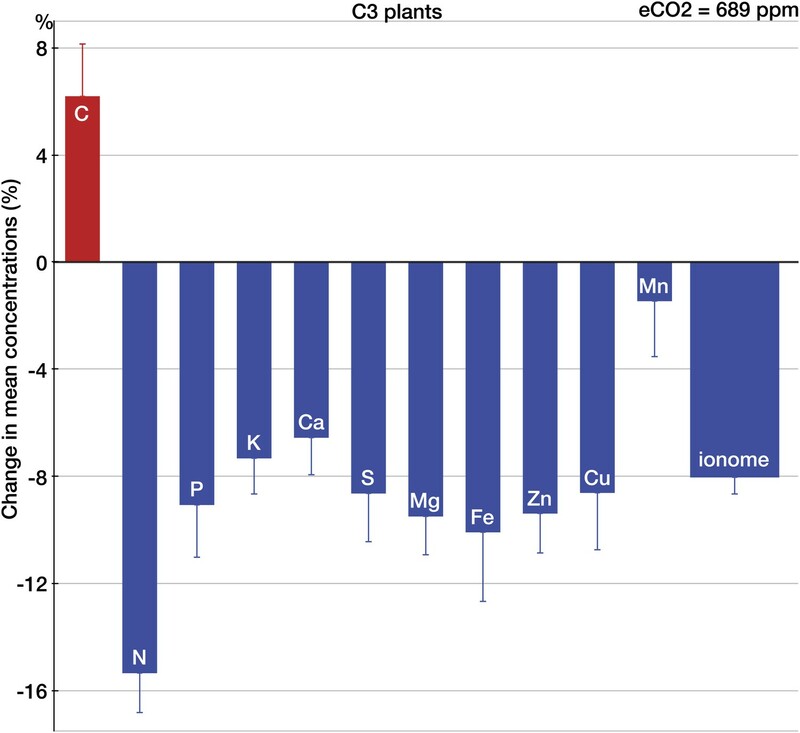 With respect to the types of experiments, the CO2 effect on the plant ionome is surprisingly robust: in both the FACE and the non-FACE studies eCO2 significantly reduced N, P, K, Ca, S, Mg, and Zn (Figures 5, 6). The high cost of CO2 required for running free-air experiments led to a much lower average level of eCO2 in the FACE studies (560 ppm) cf. 732 ppm in the non-FACE studies. It is plausible that the lower levels of CO2 in the FACE studies contributed to a smaller overall mineral decline (−6.1%, −7.8 to −4.4) cf. (−8.7%, −10.1 to −7.4) for the non-FACE studies. 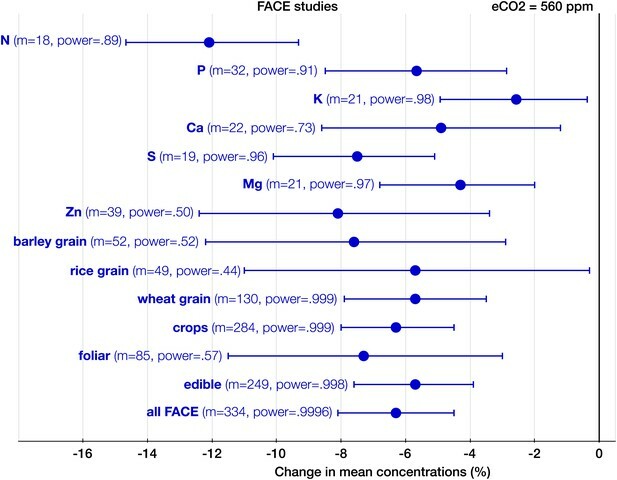 In both the FACE and the non-FACE studies, the overall mineral concentrations declined significantly in herbaceous plants and crops, foliar and edible tissues, including wheat and rice (Figures 5, 6). The CO2 effect on the plant ionome appears to be pervasive throughout latitudes (Figures 7, 8). With the exception of three small centers (in Bangladesh, Japan, and the UK), the mean mineral concentrations declined in every FACE and open top chamber (OTC) center on four continents. The mineral decline in the tropics and subtropics (−7.2%, −10.4 to −4.0, p<0.0001) is comparable to the decline in the temperate region (−6.4%, −7.9 to −5.0, p<0.00001). A finer regional fragmentation currently is not possible due to lack of data for Africa, South America, Russia, and Canada. For many existing centers the data are limited and yield a low statistical power. Germany leads the world in the FACE and OTC data generation with the largest number of mean observations of mineral concentrations (285), followed by the USA (218) (Figure 8). Though Australia generated only 30 mean observations, it stands out in the exceptional precision of some of its studies: the wheat experiments of Fernando et al. (2014) employed an unprecedented for FACE studies 48 replicates (for this reason, the study is easily identifiable on Figure 9). Since eCO2 does not stimulate carbohydrate production in C4 plants to a degree that it does in C3 plants, one would expect a milder CO2 effect on minerals for C4 plants. Indeed, no statistically significant effect was found on the ionome of C4 plants (Figure 8). Note, however, that the very limited data on this plant group are insufficient for deducing the absence of the effect; rather, it is likely that the effect size <5% for C4 plants. The CO2 effect on the C3 plant ionome shows its systemic character through the analysis of various plant groups and tissues (Figures 3, 4 and 8). 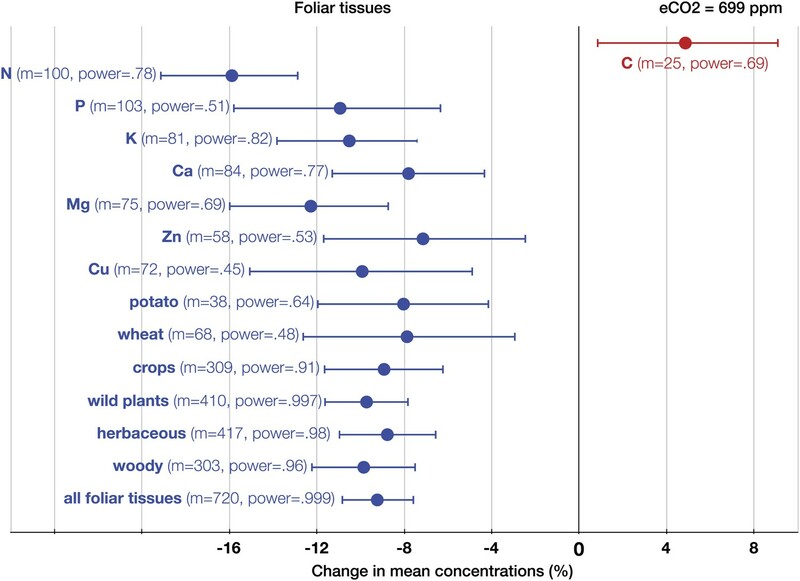 Elevated CO2 reduced the overall mineral concentrations in crops (−7.2%, −8.6 to −5.6); wild (−9.7%, −11.6 to −7.8), herbaceous (−7.5%, −8.7 to −5.6), and woody (−9.6%, −12.1 to −7.6) plants; foliar (−9.2%, −10.8 to −7.6) and edible (−6.4%, −7.8 to −5.1) tissues, including grains (−7.2%, −8.6 to −5.6). The cereal specific declines in grains are as follows: wheat (−7.6%, −9.3 to −5.9), rice (−7.2%, −11.3 to −3.1), and barley (−6.9%, −10.5 to −3.2) (Figure 8). This is notable because wheat and rice alone provide over 40% of calories to humans. Empirically robust—evident in both artificial (chambers, greenhouses) and field (FACE) conditions (Figures 5 and 6). Geographically pervasive—found in temperate and subtropical/tropical regions (Figures 7 and 8). Systemic—affecting herbaceous and woody plants, crops, and wild plants, photosynthetic and edible tissues, including wheat, rice, and barley grains (Figures 3, 4 and 8). Not only does eCO2 reduce the plant mineral content, but it also alters plant stoichiometry. Specifically, the effect of eCO2 on N is nearly twice as large as its mean effect on minerals. The differential effect of eCO2 on N (15%), and P (9%) and S (9%) translates into a ∼7% reduction in the plant N:P and N:S. In contrast to the lower N and mineral content, eCO2 increased C content by 6% (Figures 2, 3 and 5). 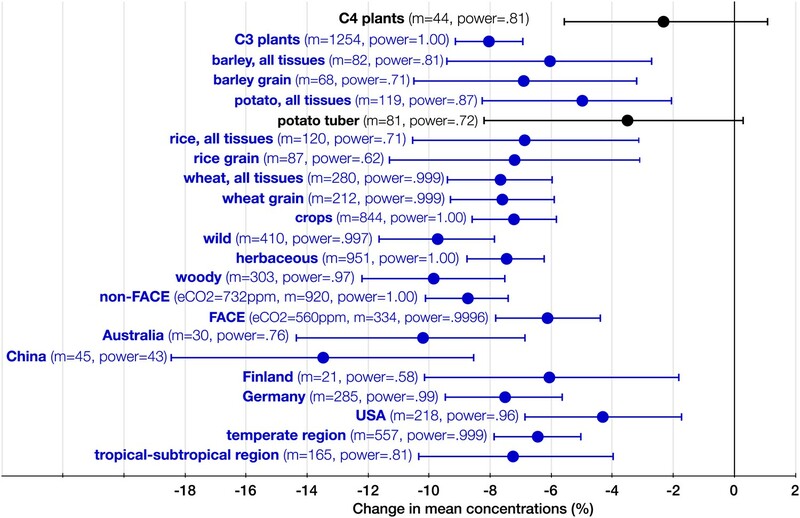 It follows then that eCO2 increases C:P and C:S by 16%, and C:N by 25% confirming the previous findings of 19–27% higher C:N in plants grown in eCO2 (Poorter et al., 1997; Stiling and Cornelissen, 2007; Robinson et al., 2012). The current dataset (available at Dryad depository) suffices to show the overall shift in the plant ionome. However, it would require much richer datasets to quantify differences among the shifts of various minerals and to assess shifts in the ionomes of individual species. Unfortunately, funding hurdles for analyzing fresh and archived samples harvested at FACE centers have significantly delayed progress in this area. Only two CO2 studies report selenium (Se) content (Högy et al., 2009, 2013), and none report data on tin (Sn), lithium (Li), and most other trace-elements. For many of the world's popular crops, pertinent data are non-existent or very limited, including (in the descending order of calories provided to the world's population, FAO, 2013): maize (the top C4 crop), soybeans (including oil), cassava, millet, beans, sweet potatoes, bananas, nuts, apples, yams, plantains, peas, grapes, rye, and oats. The current data scarcity, however, should not detract our attention from what is likely to be the overarching physiological driver behind the shift in the plant ionome—the CO2-induced increase in carbohydrate production and the resulting dilution by carbohydrates. Let us take a closer look at this nutritionally important issue. Carbohydrates in plants can be divided into two types: total structural carbohydrates (TSC; e.g., cellulose or fiber) that human body cannot digest, and total non-structural carbohydrates (TNC), most of which—including starch and several sugars (fructose, glucose, sucrose, and maltose)—is readily digestible and absorbed in the human gut. Hence, for humans, TNC carries the most of caloric and metabolic load of carbohydrates. Out of the two types of carbohydrates, eCO2 affects stronger the latter, boosting TNC concentration by 10–45% (Stiling and Cornelissen, 2007; Robinson et al., 2012). Furthermore, eCO2 tends to lower protein in plant tissues (Taub et al., 2008). Hence, we can reason that eCO2 should exacerbate the inverse relationship found between TNC and protein (Poorter and Villar, 1997). Considering that TNC and protein are two out of the three primary macronutrients (with fats/lipids being the third), it becomes imperative to quantify changes in TNC:protein, when estimating the impact of altered plant quality on human nutrition in the rising CO2 world. Regrettably, TNC:protein is rarely reported by CO2 studies; instead C:N is used as a yardstick for accessing changes in the plant quality. However, C:N poorly correlates with TNC:protein because protein is more C-rich than carbohydrates (C content in protein is 52–55% cf. 40–45% in carbohydrates). Thus, a higher carbohydrate:protein results in a lower C content. This means that CO2-induced changes in nutritionally and metabolically important ratios—TNC:protein and TNC:minerals—can substantially exceed the respective changes in C:N. We can calculate changes in TNC:protein using reported changes in TNC and protein (see ‘Formula for calculating percentage changes in TNC:protein and TNC:minerals’ in ‘Materials and methods’). Table 1 compares CO2-induced changes in C:N with respective changes in TNC:protein. It shows that eCO2 can elevate TNC:protein up to fivefold higher than it does C:N.
How shifts in TNC:protein affect human nutrition is still unknown. New evidence, however, challenges “the notion that a calorie is a calorie from a metabolic perspective” by showing that changes in dietary carbohydrate:protein:fat ratios affect metabolism and weight gain in humans (Ebbeling et al., 2012). The new evidence supports an emerging view that while obesity is quantified as an imbalance between energy inputs and expenditures (Hall et al., 2011), it could also be a form of malnutrition (Wells, 2013), where increased carbohydrate:protein (Simpson and Raubenheimer, 2005) and excessive carbohydrate consumption (Taubes, 2013) could be possible culprits. Absolute CO2 effect on TNC. Spoonful of sugars for everyone? The baseline TNC content in plant tissues varies widely. In grains and tubers, it is very high, 50–85% of dry mass (DM). Therefore, in these tissues a percentage increase in TNC is arithmetically limited (e.g., a 60% increase is impossible). However, even a modest percentage increase in TNC-rich tissues can be nutritionally meaningful in absolute terms. For example, the FACE study of Porteaus et al. (2009) reports a 7–8% increase in starch concentrations in wheat grains, which translates to ∼4 g of additional starch per 100 g DM. In contrast to grains and tubers, the baseline TNC level in photosynthetic tissues is small (usually <25%), which makes large TNC increases possible. For example, Teng et al. (2006) reports that eCO2 increased TNC by 76% in leaves of Arabidopsis thaliana. What is interesting here is that in absolute terms (per 100 g DM) the ∼5 g TNC increase in Arabidopsis thaliana is comparable to the ∼4 g TNC increase in wheat grains. More generally, CO2 studies show that—irrespective of the baseline TNC content—eCO2 tends to boost TNC by a few grams (1–8 g) per 100 g DM of plant tissue (Poorter et al., 1997; Keutgen and Chen, 2001; Katny et al., 2005; Erbs et al., 2010; Azam et al., 2013). Note that such an infusion of carbohydrates into plant tissues, all else being equal, dilutes the content of other nutrients by ∼1–7.4%. Let us compare the dilution with its pragmatic and easily graspable analog—adding a spoonful of sugar-and-starch mixture. 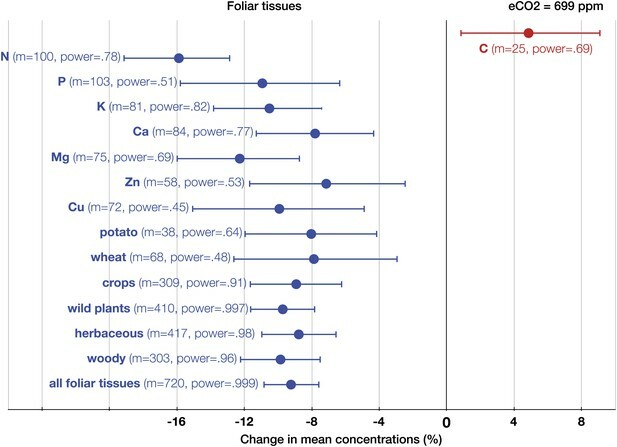 Table 2 shows that the CO2 effect on TNC:protein and TNC:minerals is stoichiometrically similar to the effect of adding a spoonful of carbohydrates to every 100 g DM of plant tissue. Clearly, adding a spoonful of sugar sporadically to one's diet is not a cause for concern. However, the inescapable pervasiveness of globally rising atmospheric CO2 concentrations raises new questions: What are health consequences, if any, of diluting every 100 g DM of raw plant products with a spoonful of starch-and-sugar mixture? What are the consequences if the dilution is not sporadic but unavoidable and lifelong? These questions are better left for nutritionists, but it is worth noting that WHO (2014) conditionally recommends that intake of free sugars not exceed 5% of total energy, which is equivalent to 5–8 teaspoons of sugar for a typical 2000–3000 kcal/day diet. Below, I shift focus on a direct consequence of the CO2-induced increase in carbohydrate production—the mineral decline in plant tissues, and explore its potential effect on human nutrition. ‘Hidden hunger’—stems from poorly diversified plant-based diets meeting caloric but not nutritional needs. It is currently the world's most widespread nutritional disorder (Kennedy et al., 2003; Welch and Graham, 2005). It lowers the GDP of the most afflicted countries by 2–5% and is partly responsible for their Third World status (WHO, 2002; Stein, 2009). A paradoxical aspect of ‘hidden hunger’ is that the minuscule amount of minerals, which a human body requires, could be provided easily and inexpensively—at least in theory—to all people in need by fortifying foods with minerals. However, in practice, such required mineral levels do not reach large parts of the world's community. The case of iodine is illustrative: although iodized table salt nearly wiped out iodine deficiency in the industrialized world, a billion people still have no regular access to it, making iodine deficiency the leading cause of preventable brain damage, cretinism, and lower IQ in children (Welch and Graham, 1999; WHO, 2002). Hence, the reality of logistic, economic, and cultural hurdles for fortification leaves the natural and bioavailable mineral content in food, and in plants in particular, to be the major, and sometimes the only, consistent mineral supply for a large part of mankind (White and Broadley, 2009; Bouis and Welch, 2010). This supply, unfortunately, is suboptimal for human nutrition with some of the consequences outlined below. Every third person in the world is at risk of inadequate Zn intake with its deficiency substantially contributing to stunting, compromised immunity, and child mortality (Brown et al., 2001; UNICEF, 2009). Iron deficiency affects at least 2 billion people and is the leading cause of anemia that increases maternal mortality (WHO, 2002; UNICEF, 2009). Millions are Ca, Mg, and Se deficient (Stein, 2009; White and Broadley, 2009), including some population segments of developed countries (Rayman, 2007; Khokhar et al., 2012). Ironically, a person can be obese and mineral undernourished—the so called ‘hunger-obesity paradox’ (Scheier, 2005), for example the many homeless in the US who rely on “cheap and energy-dense but low-nutrient” foods (Koh et al., 2012). With every third adult in the world being overweight or obese (Keats and Wiggins, 2014), WHO ranks both mineral undernutrition and obesity among the top 20 global health risks (WHO, 2002; Hill et al., 2003; Stein, 2009). While the role of mineral deficiency in obesity is still unclear, intriguing links have been found between the lower blood serum concentrations of Ca, Cr, Fe, Mg, Mn, Se, Zn, and increased body mass index (BMI), with most of the findings appearing in the last decade (Singh et al., 1998; Martin et al., 2006; Arnaud et al., 2007; García et al., 2009; Payahoo et al., 2013; Yerlikaya et al., 2013). How can the CO2-induced depletion of minerals in crops affect humans? I emphasize that the impact of CO2-induced shifts in the quality of crops on human health is far from settled. The purpose of what follows is not to make definitive claims but to stimulate research into this important but unresolved issue. A randomized controlled trial for a human diet based exclusively (directly or indirectly) on plants grown in eCO2 is unlikely and ethically questionable; and even if feasible, the trial might take years to generate results. In lieu of relevant data, we can employ a thought experiment. While such ‘experiments’ are usually reserved for physical sciences, any living system, notwithstanding its complexity, adheres to simple but irrefutable elemental mass balance, which can help us to elucidate plausible scenarios. For simplicity, let us focus on one question: how can a 5% reduction in the plant mineral content affect human nutrition? Thus, we ignore other potential or likely CO2 effects: for example higher agricultural yields; altered concentrations of lipids, vitamins, and polyphenols; substantially higher TNC:protein and TNC:minerals; differential C3 and C4 plant responses; changes in the phytate content that affects mineral bioavailability (Manoj-Kumar, 2011); and multiplicative health effects of the concomitant declines of many minerals in the same tissue. Suppose that starting tomorrow and without our knowledge, the baseline mineral content of all plants on Earth drops by 5%. A self-evident but easily overlooked mass-balance law tells us that neither thermal nor mechanical processing of raw plants enriches them with minerals (i.e., transmutations are impossible). Thus, the mineral decline in raw crops will follow into plant-based foods (except for a few food items that are fortified with certain minerals in some countries). We can safely assume that the individuals, whose dietary intake of each essential mineral has exceeded the recommended dietary intake (RDI) by >5%, will be unaffected by the depletion. This leaves us with the majority of the human population, whose diet is either at risk of deficiency or already deficient in atleast one mineral (WHO, 2002; Kennedy et al., 2003; Stein, 2009). Though a human body can synthesize complex compounds (e.g., vitamins K and D, non-essential amino acids), the mass balance low implies that no organism can synthesize any amount of any mineral. Therefore, to compensate for the mineral deficit, an organism has to increase mineral intake (or, otherwise, endure the consequences of the deficit). Taking supplements or intentionally shifting one's diet toward mineral-rich foods, for example animal products, can eliminate the deficit. Such dietary changes, however, presuppose behavioral adjustments on the part of the individuals who are aware of their mineral deficiency and have both the means and motivation to address it. A simpler way to compensate for the mineral deficit is to increase food intake, whether consciously or not. (The notion of compensatory feeding is not entirely alien—herbivores do increase consumption by 14–16%, when consuming plants grown in eCO2; Stiling and Cornelissen, 2007; Robinson et al., 2012). For a calorie deficient person, eating 5% more (to be exact 5.26%, because 1.0526*.95 ≈ 1) is likely to be beneficial. However, for a calorie sufficient but mineral deficient person, eating 5% more could be detrimental. The dynamic mathematical model of human metabolism, which links weight changes to dietary and behavioral changes (Hall et al., 2011), can help to quantify the effect of a prolonged 5% increase in food intake. When parameterized with anthropometric data for an average moderately active American female (age 38, height 163 cm, weight 76 kg, BMI 28.6, energy intake 2431 kcal/day [10171 kJ]) (Fryar et al., 2012; CIA, 2013), the model outputs a weight gain of 4.8 kg over a 3-year period, provided all other aspects of behavior and diet remain unchanged. For a male, the respective weight gain is 5.8 kg. The results are congruent with Hill et al. (2003), who argued that a 4–5% difference in total daily energy intake, a mere 100 kcal/day, could be responsible for most weight gain in the population. The above ‘experiment’ suggests that a systemic and sustained 5% mineral depletion in plants can be nutritionally significant. While the rise in the atmospheric CO2 concentration is expected to be nearly uniform around the globe, its impact on crop quality might unequally affect the human population: from no detrimental effects for the well-nourished to potential weight gain for the calorie-sufficient but mineral-undernourished. Has rising CO2 already altered the plant ionome? The rise in CO2 levels over the last 18–30 years has already been implicated in the two effects that can influence the plant ionome: higher C assimilation and plant growth (Donohue et al., 2013), and lower transpiration (Keenan et al., 2013). Considering that over the last 250 years, the atmospheric CO2 concentration has increased by 120 ppm—an increase that is not far from the mean 184 ppm enrichment in the FACE studies—it is plausible that plant quality has changed. Indeed, declines in mineral concentrations have been found in wild plants and in crop fruits, vegetables, and grains over 22–250 years (Penuelas and Matamala, 1993; Duquesnay et al., 2000; Davis et al., 2004; Ekholm et al., 2007; Fan et al., 2008; Jonard et al., 2009). While the mineral declines in crops can be an unintended consequence of the Green Revolution that produced high-yield cultivars with altered mineral content (Davis et al., 2004; Fan et al., 2008), the reason for the mineral declines in wild plants cannot be attributed to it. Can eCO2 directly affect human health? Hersoug et al. (2012) proposed that rising CO2 promotes weight gains and obesity in the human population directly (via breathing) by reducing the pH of blood and, consequently, increasing appetite and energy intake. Weight gain has been observed in wild mammals, lab animals, and humans over the last several decades (Klimentidis et al., 2011). However, it is not clear what role, if any, the rising CO2 could have played either directly (breathing) or indirectly (altered plant quality). And disentangling the rising CO2 effect from other plausible factors currently does not seem feasible due to scarce data. This brings us to the broader issue of detecting—amid high local noise—signals that are small in their magnitude but global in their scope. While some scientific areas (e.g., genomics, bioinformatics) have experienced a data deluge, many areas of global change, including the issue of shifting plant quality, have been hindered by chronic data scarcity. Fortunately, researchers worldwide have been steadily generating data on the effects of eCO2 on the chemical composition of plants. It is their collective efforts that have made it possible to reveal the CO2-induced shift in the plant ionome. New data on the effects of eCO2 on plant quality (e.g., minerals, TNC: protein, TNC:minerals, lipids, bioavailability of nutrients) can be generated very cost-efficiently by analyzing fresh and archived plant samples collected at FACE centers worldwide (the project leaders of many centers are keen to share such samples; PS Curtis, BA Kimball, R Oren, PB Reich, C Stokes; IL personal communication, July, 2006). With regard to minerals, the application of the high-throughput techniques of ionomics (Salt et al., 2008) can generate rich phenotypic data that can be linked with functional genomics. Such analyses will shed more light on changes in plant quality in the rising CO2 world. Anticipating and assessing such changes will help not only in mitigating their effects but also in steering efforts to breed nutritionally richer crops for the improvement of human health worldwide. I searched Google Scholar, Google, PubMed, the ISI Web of Science, AGRICOLA, and Scopus to find relevant articles with sensible combinations of two or more of the following search-words: elevated, rising, CO2, carbon dioxide, ppm, FACE, effects, content, concentration, %, mg, dry matter, micronutrients, plant(s), crop(s), tree(s), C3, C4, foliar, leaves, grains, seeds, tubers, fruits, minerals, chemical elements, and names/symbols of various chemical elements (e.g., zinc/Zn). I found additional studies from references in the articles identified in the initial searches. Among all plant tissues for which mineral concentrations are reported in the literature, the most abundant data are on foliar tissues (leaves, needles, shoots), and—for herbaceous plants—on above ground parts. Hence, focusing on the foliar tissues and above ground parts allows one to maximize the number of independent observations of the effect of eCO2 on each mineral. Although the data on edible parts of crops are scarcer, a dataset on crop edible tissues was compiled due to their direct relevance for human nutrition. The following objective and uniform criteria were applied for deciding which studies to include into the dataset: (1) a study grew plants at two or more CO2 levels, (2) a study directly measured the content of one or more minerals in foliar or edible plant tissues at low (ambient) and high (elevated) CO2 levels, and (3) a study reported either absolute concentrations at each treatment or relative change/lack thereof in the concentrations for each mineral between treatments. Studies that indirectly deduced mineral concentrations, reported data on N but not on any mineral, exposed only a part (e.g., a branch) of the plant, used super-elevated or uncontrolled CO2 levels were not included. Table 3 lists all the studies together with their respective species/cultivars and CO2 enrichment levels (the dataset with all the details is deposited at Dryad and GitHub). When a study reported the low CO2 level as ‘ambient’ with no specific numerical values, then I used the Keeling curve to approximate the ambient CO2 level for the year the study was carried out. The following data-inclusion rules were applied to the studies with multiple co-dependent datasets for the foliar dataset: (1) the lowest and the highest CO2 levels for studies with multiple CO2 levels, (2) the control and single-factor CO2 for studies with environmental co-factors (e.g., observations from combined eCO2 and ozone experiments were excluded), (3) the highest nutrient regime when the control could not be identified in a study with multiple nutrient co-factors, (4) the last point, that is the longest exposure to ambient/eCO2 for studies with time series, (5) the most mature needles/leaves for studies reporting foliar tissues of various ages. If, in rare instances, a publication reported three or more separate datasets for the same species or cultivar, the data were averaged prior to the inclusion into the foliar dataset. For the edible tissue dataset, the study inclusion rules were the same as for the foliar dataset with the following exception: due to relative scarcity of data for edible tissues, the data with co-factors were included in the dataset (e.g., observations from combined eCO2 and ozone experiments were included). The ‘Additional info’ column in the dataset specifies exactly what datasets were extracted from each study with multiple datasets. The above publication-inclusion and data-inclusion rules allow treating each study as independent in the dataset. At no instance, potentially co-dependent observations (e.g., multiple observations of the same plant throughout a growing season or observations of various parts of the same plant) were included in either the foliar or the edible dataset as separate studies. I used GraphClick v.3.0 and PixelStick v.2.5 to digitize data presented in a graphical form, for example bar charts. The foliar dataset covers 4733 observations of 25 chemical elements in 110 species and cultivars. The edible tissues dataset covers 3028 observations of 23 elements in 41 species and cultivars. The FACE studies cover 2264 observations of 24 elements in 25 species and cultivars. The two datasets reflect data on 125 C3 and 5 C4 species/cultivars. While the amount of statistical details provided in each study varies considerably, the following data were extractable from each study: (1) the relative change (or lack thereof) in the mean concentration between the low and the high CO2 treatments: (E-A)/A, where A and E are the mean concentrations of an element at the low and the high CO2 treatments respectively, (2) the sample size or the number of replicates (n). Since a decrease in the concentration of a mineral is limited to 100%, but an increase in its concentration is theoretically unlimited, a standard technique was applied to reduce biases towards increases. Specifically, the natural log of the response ratio, that is ln(E/A), was used as the effect size metric (e.g., Hedges et al., 1999; Jablonski et al., 2002; Taub et al., 2008). The response ratio, r = E/A, was calculated from the relative change as follows: r = 1+(E-A)/A. After performing statistical analyses, I converted all the results back from the log form to report them as ordinary percent changes. While copyright restrictions do not permit posting the original published data sources online, I will share, upon request, all the data sources in PDF form, where all the pertinent data are clearly marked for easy identification, thus removing any potential ambiguity about what data were extracted from each study. The entire dataset for the foliar and the edible tissues is available at Dryad digital depository, www.datadryad.org, under 10.5061/dryad.6356f. The dataset is available as an Excel file (formatted for easy viewing) and as a ‘CSV’ file; the latter is made-ready (tidy) for analysis with open-source (R Core Team, 2014) and commercial statistical packages (e.g., SPSS). An executable R code to generate individual results is available with the dataset at the above-mentioned depository and at GitHub: https://github.com/loladze/co2. Assistance for replicating any result and figure presented in this study will be provided to any interested party. I performed all the analyses using R (R Core Team, 2014), SPSS v. 21 (IBM, Armonk, NY, USA) and G*Power 3 (Faul et al., 2007). Meta-analytic studies often weight effect sizes by the reciprocal of their variance, which tends to give a greater weight to studies with greater precision. However, many eCO2 studies do not report measures of variation in the data (standard error, standard deviation, or variance). In lieu of the measures of variance, studies can be weighted by the number of replicates (n) or, alternatively, each study can be assigned equal weight, that is, unweighted method (Jablonski et al., 2002). I used both methods (weighted and unweighted) to calculate the means of effect sizes with 95% CIs and compared the results of both methods. Nearly in all instances, the difference between the weighted and the unweighted means was small and lesser than the standard error of the unweighted mean. For example, across all the FACE studies, the overall mineral change was −6.1% (−7.8 to −4.4) when unweighted cf. the −6.5% (−8.0 to −5.1) when weighted. For the reason of close similarity between weighted and unweighted approaches, I used the simpler out of the two methods, that is the unweighted one, when reporting the results. Since the distribution of effect sizes is not necessarily normal, I applied both parametric (t test) and non-parametric (bootstrapping with 10,000 replacements) tests for calculating the 95% CI for the mean effect size and the statistical power. The latter was calculated for: (1) an absolute effect size of 5%, and (2) the probability of Type I error, α = 0.05. If the variance of a small sample << the true population variance, then this leads to substantial overestimations of Cohen's d and the statistical power. To be conservative when estimating power for small samples (m <20), I used the larger of the sample standard deviation or 0.21, which is the standard deviation for the entire mineral dataset. The results from the parametric and non-parametric tests were very close. For example, for Zn in edible tissues (sample size = 65), t test yields (−11.4%, −14.0 to −8.7) and 0.91 power cf. (−11.4%, −13.9 to −8.7) and 0.92 power for the bootstrapping procedure. A close similarity between the results of t test and non-parametric test is expected when sample size (m, the number of independent observations for each mineral) is >30, which often was the case in this study. For reporting purposes, I used the 95% CI and the power generated by the non-parametric method, that is, the bootstrapping procedure. 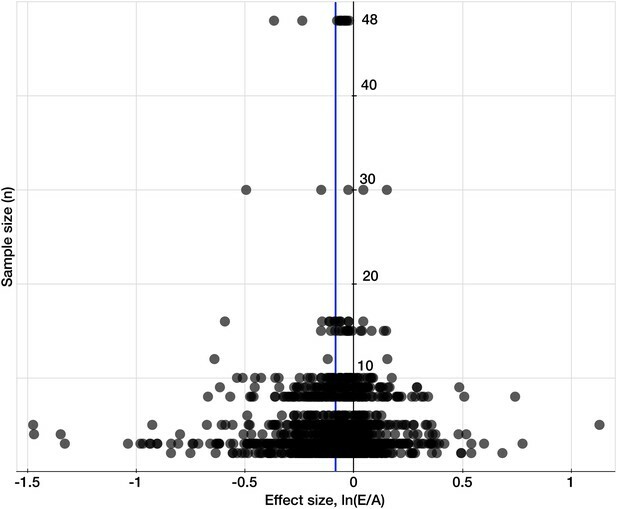 To test for publication bias or ‘the file drawer effect’ in the dataset, I plotted effect sizes against corresponding sample sizes/replicates, n, to provide a simple visual evaluation of the distribution of effect sizes (Figure 9). The resulting cloud of points is funnel-shaped, narrowing toward larger sample sizes, and overall is symmetrical along the mean effect size. This indicates the absence of any significant publication bias (Egger et al., 1997). Meta-analytic CO2 studies often partition their datasets into various categories (e.g., plant group, plant tissue, fertilization, or water regime) to estimate effect sizes for each category. Such data fragmentation, however, is warranted only if the statistical power of the resulting test for each category is adequate. Otherwise, low power can lead to non-significant outcomes and Type II errors. As tempting as it can be to partition the current dataset into many categories and cases (e.g., Zn in fruits, Fe in tuber, Cu in annuals, multiple CO2 levels), only by fragmenting the data into sufficiently large categories an adequate statistical power can be retained. Such categories include: foliar tissues, edible tissues, woody plants (trees and shrubs), herbaceous plants, FACE studies, non-FACE studies, crops, wild plants (all non-crops, including ornamental plants), C3 plants, C4 plants, rice, wheat, barley, and potato. Furthermore, I fragmented the data for C3 plants, the foliar and the edible tissues, the non-FACE and the FACE studies into individual chemical elements and into individual common plant names (e.g., all rice cultivars grouped under ‘rice’). For the regional analysis, I used only OTC and FACE studies because they reflect local environment much more accurately than studies using complete-enclosures (e.g., closed chamber, glasshouse). 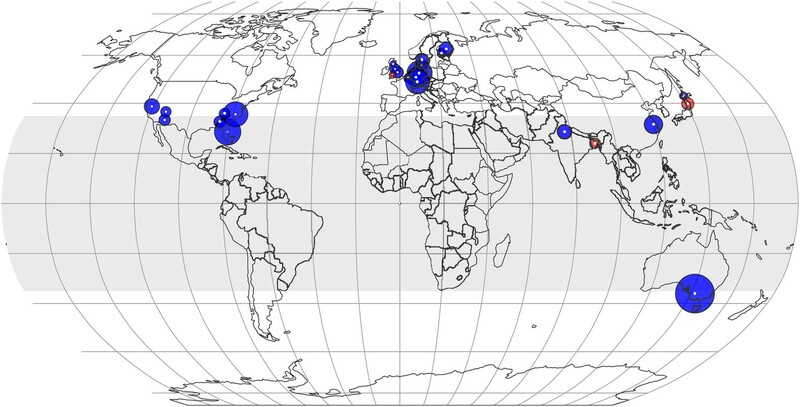 If an OTC or FACE study did not report precise geographic coordinates, then the latitude and longitude of a nearby research facility or city was used (all coordinates in the dataset are in decimal units). Figures 1–7 include results with the statistical power >0.40 for each element, country, region, plant tissue or category. Generally, power >0.80 is considered acceptable (Cohen, 1988). Unfortunately, such a level was achievable only for elements for which the data are most abundant and for the ionomes of some plant groups and species. 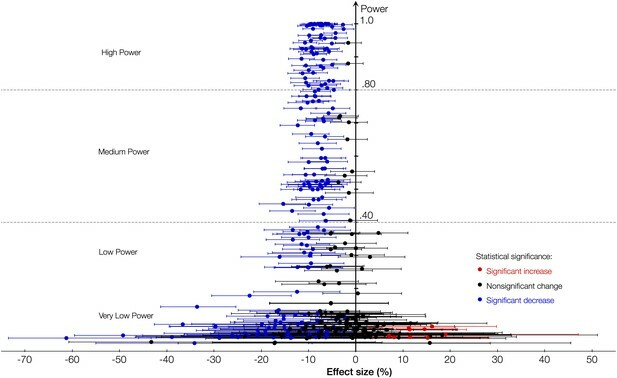 Note that the power was calculated for a 5% effect size, while the true effect size is likely to be larger (∼8%); therefore, the true power is likely to be higher than the calculated power for most results. All the results, irrespective of the statistical power, can be found in Figure 1–source data 1. Furthermore, Figure 1 shows the mean effect sizes (with their 95% CI) plotted against their respective statistical powers for all the minerals and all the plant groups/tissues. An advantage of Equation 1 is that it holds true irrespective of whether the decrease in Y is driven by some reason applicable only to Y or by the increase in X, that is the dilution by X.
British Journal of Nutrition 95:313–320. Journal of the Science of Food and Agriculture 93:3237–3244. Annals of Applied Biology 161:180–191. Journal of Experimental Botany 48:1477–1486. Journal of Experimental Botany 45:1267–1278. Natural Resources and Environmental Issues 16:1–5. International Journal of Wildland Fire 15:227–236. Food and Nutrition Bulletin 22:113–125. Plant, Cell & Environment 25:1051–1059. Journal of Plant Nutrition 20:871–881. Frontiers in Plant Science 3:195. Advances in Space Research 14:269–275. Journal of the American College of Nutrition 23:669–682. Annual Review of Plant Physiology and Plant Molecular Biology 48:609–639. The Journal of the American Medical Association 307:2627–2634. Journal of Food Composition and Analysis 20:487–495. Agriculture, Ecosystems & Environment 136:59–68. Journal of Trace Elements in Medicine and Biology 22:315–324. European Journal of Agronomy 17:353–368. European Journal of Agronomy 10:215–229. Rome, Food and Agriculture Organization of the United Nations, URL http://faostat.fao.org/. Journal of Cereal Science 56:684–690. In: LJ De Kok, L Tabe, M Tausz, MJ Hawkesford, R Hoefgen, MT McManus, E Schnug, editors. Metabolism in Plants. Dordrecht, Netherlands: Sp(ringer. pp. 231–236. Agriculture, Ecosystems & Environment 185:24–33. National Center for Health Statistics Vital and Health Statistics 11:1–40. Environmental Science & Technology 45:6997–7003. Journal of Environmental Quality 37:1254–1262. Journal of Environment Quality 32:1603–1610. Environmental and Experimental Botany 88:11–18. European Journal of Agronomy 30:85–94. Agriculture, Ecosystems & Environment 139:239–244. Does elevated atmospheric CO2 allow for sufficient wheat grain quality in the future? Journal of Applied Botany and Food Quality 82:114–121. Journal of Arid Environments 78:26–32. Agricultural and Forest Meteorology 70:141–152. An Assessment of the Intergovernmental Panel on Climate Change, URL https://www.ipcc.ch/pdf/assessment-report/ar4/syr/ar4_syr.pdf. Summary for Policymakers, URL http://www.climatechange2013.org/images/report/WG1AR5_SPM_FINAL.pdf. Annals of Forest Science 66:412–412. Journal of Plant Physiology 162:429–438. Implications for agriculture and food prices, London, Overseas Development Institute, Report. Food Nutrition and Agriculture 32:8–16. Journal of Plant Physiology 158:1307–1316. Journal of Plant Physiology 150:395–400. Environmental Monitoring and Assessment 185:205–214. Food & Nutrition Research 56:1–8. Proceedings Biological Sciences/the Royal Society 278:1626–1632. Journal of Urban Health 89:952–964. Journal of Experimental Botany 42:711–716. Journal of Experimental Botany 60:2859–2876. Journal of Hazardous Materials 177:352–361. Rising atmospheric CO2 and human nutrition: toward globally imbalanced plant stoichiometry? Trends in Ecology & Evolution 17:457–461. Plant, Cell & Environment 28:733–749. Agriculture, Ecosystems & Environment 54:175–185. Will rising CO2 affect Zn and Fe bioavailability in food grains? Plant, Cell & Environment 36:697–705. Advances in Space Research 18:85–92. Journal of Experimental Botany 64:355–367. Journal of Plant Nutrition 25:2161–2171. Agriculture, Ecosystems & Environment 101:31–38. Chinese Journal of Rice Science 19:350–354. Journal of Experimental Botany 44:1523–1525. Environmental and Experimental Botany 99:86–99. Agriculture, Ecosystems & Environment 118:55–64. Journal of Cereal Science 50:278–282. Plant, Cell & Environment 20:472–482. In: FA Bazzaz, J Grace, editors. Plant resource allocation. San Diego: Academic Press. pp. 39–72. Animal Feed Science and Technology 149:322–332. Journal of Plant Nutrition 31:758–773. R Foundation for Statistical Computing, Vienna, Austria, URL http://www.R-project.org/. British Journal of Nutrition 92:557. Bangladesh Journal of Scientific and Industrial Research 44:241–246. European Journal of Forest Research 128:117–128. Journal of Hazardous Materials 187:58–66. MetaWin: statistical software for meta-analysis, Sunderland, Massachusetts, Sinauer Associates, URL http://www.metawinsoft.com/. Annual Review of Plant Biology 59:709–733. Journal of the American Society for Horticultural Science 122:849–855. What is the hunger-obesity paradox? 883–884, Journal of the Academy of Nutrition and Dietetics, 105, 886, 10.1016/j.jada.2005.04.013. Grass and Forage Science 52:232–241. Soil Science and Plant Nutrition 43:1131–1136. Water, Air, & Soil Pollution 64:585–600. Environmental Monitoring and Assessment 185:6517–6529. In: United Nations Economic Commision for Europe, Forest Foliar Condition in Europe Results: Results of large-scale foliar chemistry surveys 1995. European Commission, Brussels. How does elevated carbon dioxide (CO2) affect plant–herbivore interactions? The science of obesity: what do we really know about what makes us fat? Journal of Plant Nutrition 11:37–49. Forest Ecology and Management 137:1–11. Journal of Trace Elements in Medicine and Biology 18:299–307. European Journal of Clinical Nutrition 67:507–512. Archives of Animal Nutrition 67:263–278. Agriculture, Ecosystems & Environment 104:493–507. The Indian Journal of Medical Research 137:339–345. International Journal of Phytoremediation 10:161–172. eLife posts the editorial decision letter and author response on a selection of the published articles (subject to the approval of the authors). An edited version of the letter sent to the author after peer review is shown, indicating the substantive concerns or comments; minor concerns are not usually shown. Reviewers have the opportunity to discuss the decision before the letter is sent (see review process). Similarly, the author response typically shows only responses to the major concerns raised by the reviewers. Thank you for choosing to send your work entitled “Hidden shift: elevated CO2 alters the plant ionome depleting minerals at the base of human and herbivore nutrition” for consideration at eLife. Your full submission has been evaluated by a Senior editor and 3 peer reviewers, and the decision was reached after discussions between the reviewers. We regret to inform you that your work will not be considered further for publication at this time. The following peer reviewers have agreed to reveal their identity: David Salt and Lisa Ainsworth. This is not an easy call, as all reviewers agreed that it was a solid analysis that builds significantly on the previously published work in Trends in Ecology and Evolution in 2002 and that the power analysis was a particularly noteworthy advance. The reason for decision to reject lay in the concerns about the “scaleability” the results from the FACE trails to human nutrition. The conclusions were based on analogies to human obesity studies and were simply too strongly drawn to be supported by the data. It also wasn't clear to the reviewers that the FACE results could extrapolate to tropical agricultural systems given that tropical agricultural productivity is limited by other factors (water, nitrogen, pests etc). This manuscript details a meta analysis based on published data on the concentration of elements (aka ionome) in various plant tissues and species from studies in which atmospheric CO2 has been varied. Analysis of the data in an appropriate statistical framework revealed significant chances in the plant ionome after growth of plants in atmospheres with elevated CO2 (in both laboratory and field-based experiments). Many of these changes were not observed as significant changes in the original studies due to low sample sizes. Further analyses by integration of published data on carbohydrate content of plant tissues reveals that these changes in the plant ionome are likely due to dilution by the enhanced accumulation of carbohydrates observed when plants are grown in elevated CO2. An interesting discussion is then presented on the potential significance of this dilution of essential mineral nutrients in our global food supply. I enjoyed reading this manuscript and liked the discursive style (something that is now quite rare in the scientific literature). However, I felt the manuscript was too long and both the Introduction and Discussion could be significantly shortened after careful editing without significant loss of readability or information content. For example, the long discussion on sample size being important to detect significant differences between treatments when the effect is expected to be small could be significantly reduced. 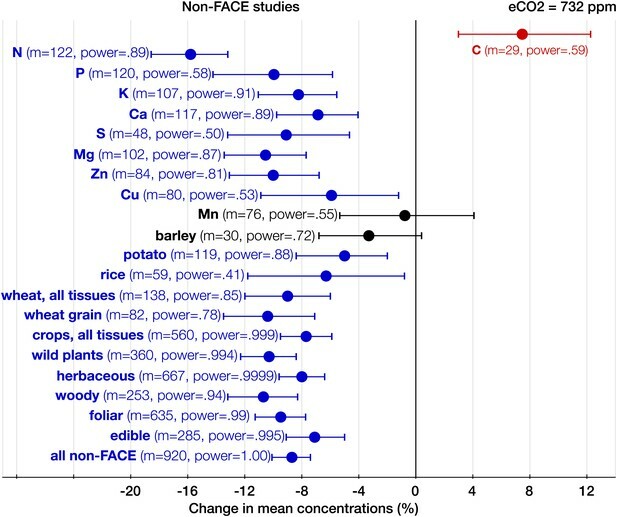 This is an interesting review of the effects of rising CO2 on the mineral content of plants. This author previously published a study on this topic, alerting the community to the detrimental impact that rising CO2 concentrations were having on mineral content of plants and edible parts of plants. In the current manuscript, a much larger data set is compiled and statistically analyzed to report that elevated CO2 significantly decreases mineral content in leaves and other edible parts of plants. Much thought and discussion is given to the power of the meta-dataset and I think that this is an important aspect of the paper. Finally, a thought experiment is done to discuss the potential impact of the increase in C and decrease in mineral nutrients on human health. I think that the biggest question from this analysis is the impact on human health. In regions of the world where people are most dependent on bioavailable calories and nutrients from plants, few elevated CO2 experiments have been done. For example, there are no published data from FACE experiments in the tropics. In tropical regions, drought, extreme temperatures and/or very poor nutrient supply likely limit agricultural production and in these areas elevated CO2 may have substantially less impact on plant growth or plant quality. Therefore, it is very uncertain what effect elevated CO2 will have on human nutrition there, and I think this needs to be acknowledged as a gap in the data and in the potential inferences made in this paper. I very much enjoyed reading this paper. It takes a clever approach to the highly significant issue of how climate change might impact on the human food chain via its influence of plant composition, and in so doing does an excellent job of discussing the results in a broad integrative context. Usually a critical reviewer, I could find little to complain about here: the story is important, convincing, and nicely told. Thank you for sending your work entitled “Hidden shift: elevated CO2 alters the plant ionome and depletes minerals at the base of human nutrition” for further consideration at eLife. Your article has been favorably evaluated by Ian Baldwin and 3 new peer reviewers. This manuscript presents a unique collection of data on CO2-induced changes of the plant ionome, which clearly show that the majority of plants investigated so far showed a remarkably similar tendency in their response to CO2 (albeit with variation). This is clearly an under-appreciated component of the undeniable rise in global CO2 levels, which deserves more attention. The reviewers also recognized that the core of the argument that relates to the impact of changes in nutrient content of the edible portion of food crops on human health has simply not been settled, and were (again) split as to whether this problem was sufficient to reject the manuscript for eLife. After discussion, a consensus agreement was reached that the manuscript could be accepted if it was substantially revised so that it was clear that impact of changes in nutrient content of the edible portion of food crops on human health has not been settled. We hope that in revising the manuscript, this uncertainty is explicitly addressed and that you could highlight the need for more research to address this very important but festering issue. In addition, it was felt that the Introduction should be shortened, downplaying the thought experiment, and significantly tempering the conclusions drawn in the Discussion. This argument is flawed. There are published FACE, open-top chamber and greenhouse experiments carried out between the 35° N & S latitudes – the tropical and subtropical regions, where large parts of malnourished population reside (e.g., Ma et al. 2007; Jia et al. 2007, Pal et al. 2003, 2004; Singh et al. 2013; Khan et al. 2012; Azam et al. 2012), and they do show declines in the plant mineral content. Prompted by the eLife review, I made the regional analysis of all the CO2 studies carried out between the 35° N & S parallels: it shows that the plant mineral content declines by 5% in the region. Furthermore, many countries in the tropics rely on imports of wheat, maize and soybeans, most of which are grown north of the N 35°parallel, where FACE and other experiments also reveal declines in the crop mineral content. No reviewer found any logical flaws in my human-nutrition thought experiment, which relies on the rigor of mass balance laws. However, I understand that such “experiments” are not conventional even if their conclusions are valid. For this reason, I can tone down and shorten the health and obesity discussion. The revised paper will focus on firmly establishing a novel and important aspect of global change – the shift in the plant ionome induced by the rising CO2. I emphasize that this is a novel result because the last definitive word on the issue was Duval et al. (2011) meta-analysis claiming the absence of any prevailing effect of elevated CO2 on the plant minerals and, specifically, the lack of response of grain minerals to high-CO2 – claims that are opposite to my results. The power is in your hands to give my revised and stronger paper further consideration at eLife and to advance the progress on this important issue. After discussion, a consensus agreement was reached that the manuscript could be accepted if it was substantially revised so that it was clear that impact of changes in nutrient content of the edible portion of food crops on human health has not been settled. We hope that in revising the manuscript, this uncertainty is explicitly addressed and that you could highlight the need for more research to address this very important but festering issue. I have added a new subsection to the Discussion, titled “Data Scarcity,” noting that for many crops, the pertinent data are limited or non-existent. I deleted the passage referring to my 2002 ‘thought experiment’ from the Introduction and do not mention it anywhere else in the manuscript. I deleted the reference to Loladze & Elser (2011) together with the sentence stating that the cellular stoichiometric homeostasis is sensitive to the environment. I have shortened and simplified the passage about the dichotomy between CO2 effects on N and minerals. I have shortened and improved readability of the list of questions at the end of the Introduction. The new Introduction is shorter by ∼200 words. ...and significantly tempering the conclusions drawn in the Discussion. 1) Deleted Figure 9 showing the graphical output of Hall et al. (2011) dynamic model of weight gains in a female and a male. In addition, to the above changes I revamped the Results by separating them into clear subsections. Furthermore, the readability throughout the paper was improved. The author declares that there was no external funding for this work. The author thanks George Kordzakhia, Nik Loladze and Marina Van for discussions, David Salt and four anonymous referees for comments, and Dmitri Logvinenko for providing access to library resources. The author acknowledges NSF rejections to support this research (proposals Nos. 0548181, 0644300, 0746795). There is concern that crop plants are becoming less nutritious as the levels of carbon dioxide in the atmosphere increase.